Aria of Sorrow is at least, depending on what you consider to qualify, the sixteenth entry in the Castlevania series, a series for which inspiration has been increasingly harder to come by. The muses had illuminated Symphony of the Night, the last great Castlevania game, which explored adventure gaming untouched by the series since Castlevania 2. Unfortunately, Aria of Sorrow is also the third Game Boy Advance Symphony of the Night-inspired adventure, and by now even the light from that font has dimmed. From its beginning I felt that Aria wasn't special (I finished it not because the game compelled me, but because the aftermath of an apartment fire temporarily separated me from all systems but my Game Boy). Yet Symphony of the Night fiercely grabbed my attention. Part of Aria's problem may be that it isn't original enough to make a strong impression. The issue isn't merely that Aria is yet another 2D maze-based adventure. Simon's Quest, Symphony of the Night, and Circle of the Moon are all 2D adventures, but none seemed so unoriginal in the wake of the others. 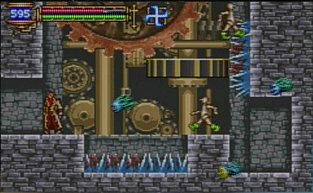 Aria takes from SotN not only a vague premise, but also a similar weapon system (armaments have not only different strengths but also ranges, speeds and trajectories), special abilities (double jumps and bat transformations are necessary), a false ending that is overcome by equipping particular items during a boss fight, a true end game based on rearranged castle elements, and a whip wielding Belmont bonus playable character. In the context of the Castlevania series, even beyond SotN, Aria's settings are stale. It revisits castle corridors, the perennial clock tower, caverns, and even more recent inventions such as an arena. It adds nothing new of its own. Because Aria's fundamentals are based so strongly on SotN, it remains enjoyable on a basic level. Its hero, Soma, controls well enough, and those who liked exploring passages and gaining powers in other games may like it again. But Aria has nothing extra or unique to elevate it above mediocrity. In contrast, Symphony of the Night has such explosive urgency that it immediately begins with a boss fight; it intrigues with a plot that reintroduces Alucard from the masterpiece Dracula's Curse, and pays tribute to Castlevania generally; and its soundtrack is so dense with greatness that within merely the game's first ten minutes you'll have heard five fantastic pieces of music. Aria of Sorrow can't match this energy level, nor can it match the quality of those particulars. Its soundtrack may not be bad (my favorite pieces were the Floating Garden and a song that incorporates Heart of Fire) but it is not anywhere near SotN's league. Aria's story - which involves a castle hidden (somehow) in an eclipse, and the idea that other people can (somehow) become a new Dracula - is nonsense. The idea that Dracula can be replaced by a new Dracula has no basis in vampire lore, nor is it an outgrowth of established Castlevania canon. From what science has taught us of the physical nature of eclipses, hiding a castle in one is about as reasonable as reaching the moon by walking far enough north. I realize this is fantasy, but a flavor of reality makes myth easier to swallow. The reason this story needs to resort to such poorly considered incoherencies is that there is no real need for a new Castlevania game, at least not for this Castlevania game, and Aria's attempt to justify itself may be the series' worst since Castlevania 4 offered no justification at all. As Aria's beginning is lame, so the game remains as it develops. Aria's labyrinth is not completely without mysteries: A giant stone head blocks a hall. And a boat is abandoned on dry land. However, the solution to these few puzzles is so obvious I solved them in minutes if not seconds. Aria's bosses too are unchallenging, even for an adventure game. Legion, for example, an assemblage of bodies, based on SotN's Granfaloon, circles his room so slowly that staying ahead of him and away from danger is trivial. Balore, a giant troll who peers and attacks through a crack in his subterranean prison, is introduced with a surprise similar to a moment early in Salamander 2. But his arena has safe spots on either side. And while the simple act of exploring Aria's tunnels may give some people some pleasure, the extent of that pleasure is bounded by the small extent of the game, and what little there is to explore: I originally beat the game in about six hours and earned the more complete ending in less than two additional hours of play. Aria's exploration even has less freedom. 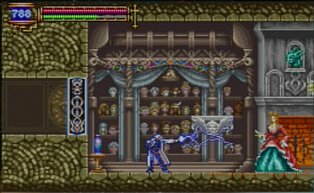 While Legion or Balore may be fought in either order, there is less true nonlinearity than in SotN. The only aspect of Aria of Sorrow that is even intended to be original is the game's Soul-based magic system. Upon killing any enemy, you have a small chance of absorbing the soul and corresponding power of the enemy's species. Over one hundred souls — in three categories (each of which may have a power active simultaneously) — can be earned. I think that the true test of a system like this is in the degree to which it must be used strategically. In Circle of the Moon, I constantly varied, in search of an advantage, strategies and spells, from offensive to defensive, from those that alter physical attributes to those that grant specific attacks, from elemental powers to familiar summons, to novel abilities that defy categorization. The breadth of Aria's abilities compares to Circle of the Moon's, yet commands less consideration. Many souls, such as the bat's chirp, are worthless. Others are so powerful they supplant rather than complement earlier souls: Once I earned the Lightning Doll soul, whose electrical attack is fast, powerful, long-ranged, and hits multiple times, I never needed to use another offensive magic to beat the game. The most esoteric applications for the more exotic souls (such as the Killer Mantle) are limited simply to earning more souls. A good game has interplay between its hero's abilities and their challenges. But with undemanding bosses and simplistic adventuring, there's little for Aria's souls to react with. A special magic system can supplement a game's fundamentals, but cannot replace them. And Symphony of the Night, with a vastly greater soundtrack, better exploration, a more involving story, and far more originality and impact, has fundamentals uniformly superior to Aria of Sorrow's. Aria's other feature (besides its magic) beyond SotN is portability, but, unsatisfying as it is, even played where other games cannot, Aria of Sorrow is no substitute for Symphony of the Night.